Rolling ladders may be used in place of the folding ladders that are typically used to performed work at or near ceiling level or at similar heights. Rolling ladders provide a wider, longer and more stable work platform. The large work area together with the guardrail system, reduces the likelihood that a worker will fall. Work from a ladder often causes a worker to reach excessively beyond the side rail or to stand too high on the ladder. The large work platform also makes it easier for workers to position themselves in a more ergonomically correct position relative to wide tasks such as installing or insulating large ducts. Rolling ladders are available in a large variety of heights and widths from manufacturers including Cotterman and Ballymore. Cotteman rolling ladders may be fitted with powered lift table and are available in foldable, high clearance versions with ten inch wheels. A Ballymore configuration combines an elevated material cart with a rolling ladder which can be used for moving and holding material to be installed. Rolling ladders come in widths of 30 inches and less, allowing them to be used in interior rooms. Rolling ladders may be a good alternative to a scissor lift in areas that do not permit access for a lift or for tasks that are too brief to justify renting a lift. Rolling ladders must not move when occupied and must be equipped with at least two swivel lock casters Rolling ladders of 5 steps or 60 inches high must have handdrails at least 29 inches high (CALOSHA requires handrails to be 39 to 45 inches high). Rolling ladders must not move when occupied (1926.1053.(b)(11). OSHA requires that rolling ladders be equipped with at least two swivel lock casters (29 CFR 1910.29(a)(4)(ii). For rolling ladders of 5 steps or 60 inches high, OSHA requires handdrails at least 29 inches high (29 CFR 1910.29(f)(4)(i) and (ii). CALOSHA requires handrails to be 39 to 45 inches high. 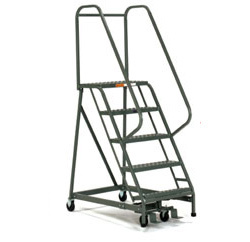 Rolling ladders should also meet the ANSI A14.7 standard. Rolling ladders reduce musculoskeletal disorders from overhead work as well as falls. Fall hazards are reduced by the greater stability and work area of a rolling ladder relative to folding ladders. Muscluloskeletal stress to the shoulders is reduced by the larger work area which allows the worker to maintain a more advantageous work position while installing, repairing, insolating or removing ducts or other wide components. There is are no published reports on the reduction of risks from rolling ladders, though any evidence of risk reduction can be found with the reduced numbers of falls and fatalities on worksites that use rolling ladders. Rolling ladders may increase productivity by reducing the number of times the worker must reposition the ladder. For extensive work or work at higher elevations a scissor lift may be a safer option. Larger rolling ladders are too heavy to be lifted by one worker. Two or more workers may be required to load and unload the ladder. Once on the ground the ladder can be rolled between positions. Rolling ladders are cheaper than scissor lifts. Therefore, they are more likely to be used as a substitute for regular ladders at low heights.